A fascinating journey exploring history, culture and nature in the splendors surrounding the Mayan civilization! Through the beauties of the Yucatan peninsula and Guatemala's highlands, crossing Belize and Chiapas, discover the mysteries of yesterdays Mayan empire and its wonders of today. Explore and discover Maya sites like Tikal, Chichen Itza, Palenque and many other archaeological sites of great interest. Arrival in Cancun, transfer to Playa del Carmen. Overnight in a charming and friendly Inn near the beach and Avenida Quinta. NB: You will be picked up at the airport at the time of your arrival, which can be any time in the day. If you are already in Cancun, we will pick you up at your hotel or at any convenient location for you. Meet your guide and travel mates for breakfast. Exploration of the archaeological site of Tulum, the "City of Dawn" (dating from 900 to 1600 AD), one of the only Maya sites surrounded by protecting walls and located right on the Caribbean sea; our first steps in the exploration of the famous empire. Visit the Coba site ruins (600 to 900 AD). Hidden deep in the tropical jungle, Coba was once the largest city of the Mayan civilization. Nohoch Mul, the great pyramid, is one of the tallest of the whole Maya world. In the afternoon, you may wish to enjoy a refreshing swim in the Gran Cenote, one of the crystal clear lakes "gateways'" to the submarine caves of Yucatan. Beach and relaxation in the afternoon. Overnight in a charming 3* hotel near the Tulum beach. Early departure towards the colourful metropolis of this small coastal country (7 hours drive). Exploration of Belize City, a real Caribbean style city where you'll have good opportunities to meet Belizeans going about their everyday lives. Overnight in a charming upscale inn on the seashore. Early morning flight leaving Flores towards Guatemala City (45min.). Transfer (30 min.) to your Antigua hotel upon arrival - you'll then have plenty of time to relax and explore while your driver-guide covers the distance to meet you for dinner. Overnight in a charming superior Inn in the colonial city of Antigua. Exploration of La Antigua, considered the most beautiful city of Guatemala; multicoloured, lively markets, impressive churches and delightful colonial architecture lend an irresistible character to this cultural center. Transfer to Panajachel (2 to 3hrs drive) in the afternoon. Overnight in a nice hotel of Panajachel. A magnificent region surrounded by tall volcanoes and charming villages all around the lake... Cruising the waters and hiking in the villages we explore the region. Overnight in Panajachel. On our way back to Mexico (7 to 8hrs + border crossing). We're heading for San Cristobal de Las Casas, a charming colonial city located in the Chiapas Mountains of Mexico. Overnight in a friendly hotel in the San Cristobal center. On our way to Palenque (4hrs drive) we visit the cascades of Agua Azul, a marvel of geology, a pure pleasure for the body and the spirit. Then, we head for the tropical jungle region of Palenque, a magical place. Overnight in bungalows bordering the dense jungle surrounding the Palenque Maya site. Exploration of the Palenque Maya site (600 to 900 AD) located in the dense jungle at the foot of the Chiapas Mountains. Palenque is one of the most extensive Maya sites, but of its 500 buildings a few only have been excavated to this day. We will discover some of the marvels left behind by the ancient empire: canalizations, pyramids, administration buildings; the whole site proofs a highly developed sense of architecture. The clear water cascades of the area are still refreshing visitors; turbulent, polishing the stones on which once walked the Mayas. Overnight in jungle cabins as night before. 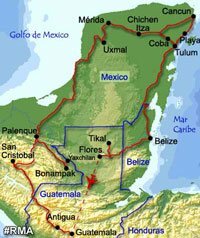 Exploration of Bonampak and Yaxchilan Maya sites. Bonampak was a major find for archaeologists because of its brilliant murals depicting 8th century Maya court life, rituals and battles. These murals were preserved for centuries by a coating of calcite washed down from the ceilings. Yaxchilan ruins lie on the left bank of the Usumacinta River just a little northeast of Bonampak and have mostly not been restored due to its difficult-to-reach location. Even the major monuments are mostly covered in trees, but there are many amazing carvings to see, plus the chance to get a feel of what a major Maya archaeological site was like before restoration. To reach these mystical places we transfer very early in the morning by mini-bus from Palenque to Corozal, where we board a boat to Yaxchilan. Here, we visit the site and return by boat to Corozal from where we continue to Bonampak by mini-bus. After our exploration of the site, we return to Palenque, for overnight in our jungle cabins. Early departure towards Uxmal (6½ hrs drive). Check-in at the hotel near the Uxmal ruins, break for refreshments before exploring the Uxmal Maya site (500 to 900 AD). It is located in the Puuc Mountains, whose name was given to the special architectural style one finds here. Some of the special characteristic features of the Puuc style are the columns and arches made out of carved stones. Uxmal is one of the major sites in Yucatan. Overnight in a nice hotel in Uxmal. Exploration of Merida (1½ drive), city of hammocks and multicoloured textiles. This colourful, friendly and charming city dates before the Spanish colonization but was much transformed by it and it is now one of the nicest cities to visit in southern Mexico. In the afternoon, after a 2 hours drive, you will explore the archaeological site of Chichen Itza (600 to 1000 AD): popular, impressive, inevitable, the peak! Overnight in Valladolid, a typical, peaceful and charming colonial city between Chichen and Cancun. Transfer to the international airport of Cancun or to Cancun city center. End of the adventure. The entry fees on all the Maya sites.